This project is a fantastic example of seeing issues with your current brand being able to grow to meet higher demands. SHAPE Reclaimed is based out of Missouri and is owned and operated by my friend, Abbie Belliston's dad and step-mom. Abbie is a big advocate for the products and programs that SHAPE offers to medical professionals to help their patients transform their health for the better. The company's reach is growing each quarter, and their current brand is in dire need of an overhaul to better represent the quality of the products and services offered. Though Abbie didn't have a position in the company at the time, she self-funded this rebranding endeavor to present to company leadership. Long story short, she did present the material, and they offered her a full-time position because they were so impressed not only by the design work but also her initiative. So let's dive in! Here you can see their old logo. They love the tree motif because it represents their program with the branches, and all the leaves and flowers represent the lives that it touches. However, the old tree wasn't even technically part of their official logo, but they used it sometimes and sometimes they didn't. Also, it is so incredibly complex that it becomes a mushy jumble of pixels unless sized very large. The gold gradient coloring of the tree feels very dated and the bar at the bottom feels like an afterthought. The old word mark is equally dated with the purple gradient fading in the background. Then there is the odd capitalized "C" in ReClaimed. Abbie and I couldn't figure out any reason why that was the case, so we tossed it out the window. So, this logo has some major issues of being dated, way too complex, and confusing. I'm probably coming off pretty harsh in my critique of their logo. Fair enough. However, the objective opinion of an outsider is sometimes needed to understand the reasons for changing. Logos are the face of companies, and people base their first impressions off of them. Make the impression a good one. Enter the new design. Abbie and I decided that the tree should be the symbol that SHAPE is known for since it symbolizes a lot. We majorly modernized the tree and made sure it had three "roots" that represent three core values. We also twisted the roots together to show that it all works together as a system. We kept the leaves to represent the lives the program touches but simplified things once again. Overall, we wanted to design a new symbol that would truly represent the company in the best way possible. As for the typography, the company's name is almost always shortened to just "SHAPE", so we decided to emphasize that with a simple wordmark, and downplay "reclaimed". We also ditched the capital "C". Again, we just wanted to simplify, simplifly, simplify. Along with the new logo design, we wanted to show everyone at headquarters how this new look would be incorporated into their current products and marketing materials. I'm always explaining to my clients that a brand is made up of much much more than just a logo, and I was so pleased that Abbie completely understood that from the get-go. 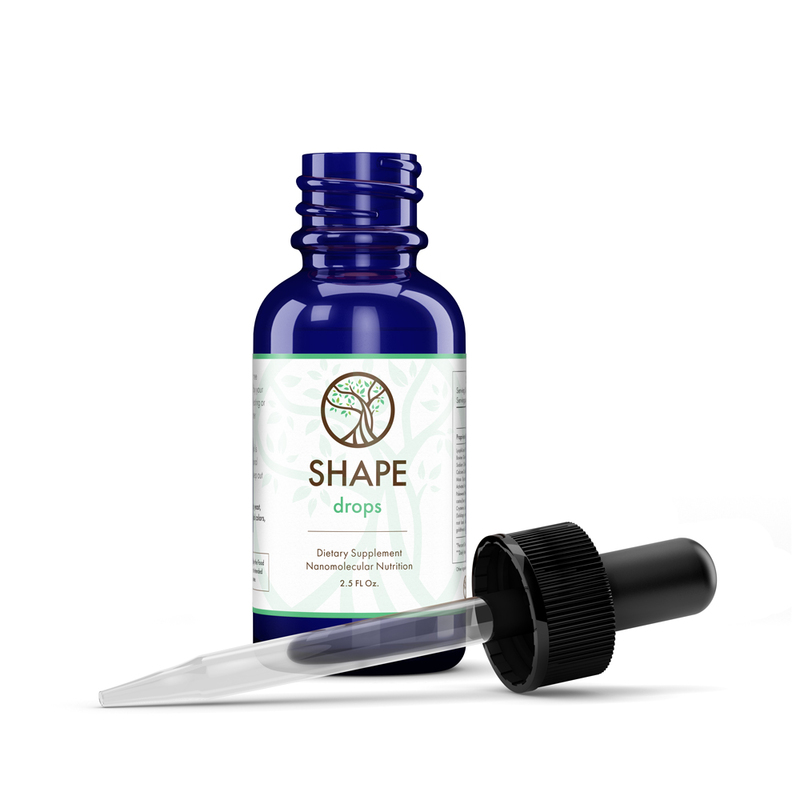 SHAPE Drops is the core product of their product line, so it was imperative that we showed them how the brand would work with the bottle label. I designed a few different mockups for the presentation to give them a good idea of what it could look like. Next was The Complete Patient Guidebook which walks patients through the whole program step-by-step. This booklet was also a must-have item to present to the leadership since it is integral to the patient's experience with the program. We explored a little bit here using the logo almost like a window into a happier more healthy lifestyle. After the Guidebook, we tackled the website which was in desperate need of an overhaul. For presentation and budget purposes, we only worked on the look and feel of the homepage, but it made a world of difference. The old website's navigation was confusing and incredibly complex with 15+ links in some of the drop-down menus. Things needed to be simplified without losing usability. Abbie worked on narrowing the focus of the navigation and I worked on displaying options in a simple way that would make it easy to use. This project was a big undertaking that was unbelievably enjoyable to work on. I am glad that Abbie came to me to help her show the company leadership the possibilities of their brand. These designs have not yet been implemented by SHAPE Reclaimed, but I have permission to post them online.